The great upswing of the markets on news of better than expected holiday shopping created enough of a diversion to almost have us forget about the risk factors over in Europe. That is exactly what price alerts were made for! 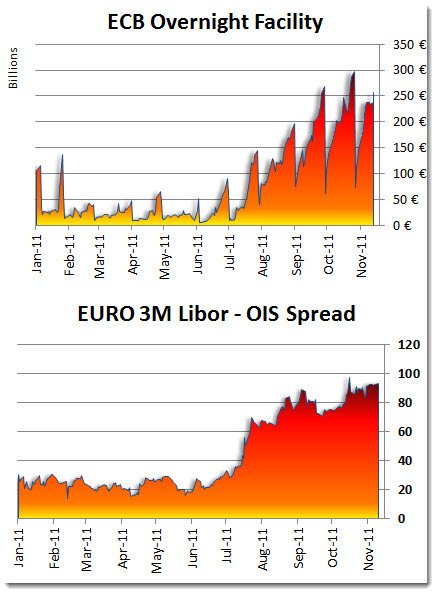 The alert came in close to 12pm that the Euro 3M basis Swap cracked -150. 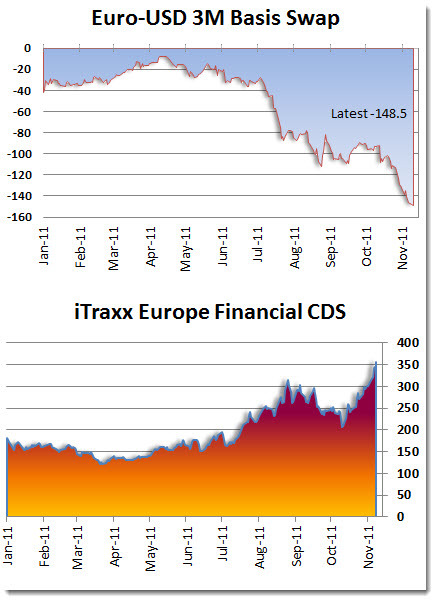 Recall that we have been writing about this as an important measure of liquidity. This level is something to take notice of as it shows that the financial markets are not functioning normally. This particular indicator is more proof that even a well placed rumor about a bailout of Italy or a stock market moving up by 3 or 5% is not giving enough comfort for anyone to lend money to European institutions. Notice that the ECB Overnight facility was tapped again. Perhaps it is time to re-assess the risk of a failure and how that could play out. By far, the most worrisome of all of the news today was the notion that the IMF rumor of bailing out Italy was well received and the ultimate squashing of that same rumor had no effect. Smells like a short-covering rally that will need to prove itself.